It’s October and that means redfish in the Apalachicola Bay! Actually, more than just redfish—a lot more. Read on. See all the boats in town? See all the trailers under the bridge? The Apalachicola Bay is one of the world’s best fishing holes. There is good fishing here the year around but some months are much better than others. And October through November is the best time of year for redfish and speckled trout. Done right, they are yours for the taking. Sure, offshore fishing (20 – 30 miles out in the Gulf) for big game fish has its fans, but let’s keep it local and talk about inshore fishing. Inshore fishing is done in shallow waters with land in sight. We talked to Tom Morgan about the equipment you need, the styles of fishing, and the species of fish. 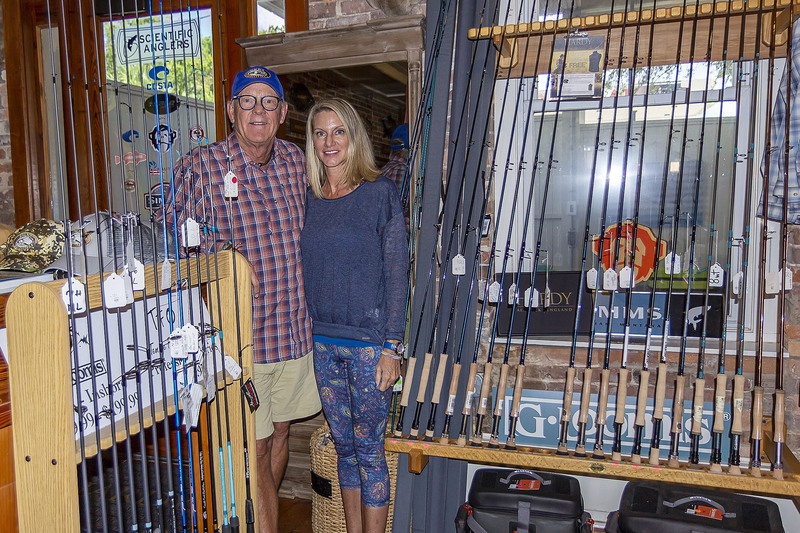 Tom and his wife Sharon own Apalach Outfitters, a very busy store in the heart of downtown Apalachicola. A store with gear and wear for fishing and lots, lots more. Tom is a lifelong fisherman who still hunts and fishes with hometown buddies from as far back as the 6th grade. Growing up in Jackson, Mississippi, he tells of the time when he was just 15. With no boat and no car, they would fish in the reservoir spillway runoff after heavy rains. The thrill of catching lots of big largemouth bass on artificial lures hooked him for a lifetime. After college he did a lot of inshore fishing in the Louisiana bayous. His love of inshore fishing grew, and with is own skiff now, he never misses a chance to get out on the bay. Going over the equipment, Tom explains the basics of inshore fishing. Both fly and spinning rods and reels are used. Spinning rods can be used with either live bait or lures. Tom has a great selection of spinning rods and reels, fly rods and reels, and artificial lures. The price range is from reasonable to, well, let’s just say pricey. Explaining the difference, Tom points out that higher priced reels have a superior drag system and better materials are used in their construction. Higher priced rods have more and higher-quality graphite, they are stronger, and provide the angler more distance and casting accuracy. Looking at some of the price tags, you have to ask: do people really buy these things!? Oh, yes! During tarpon season, Tom get customers from as far away as California, Australia, and South Africa. These kinds of fishermen generally want the best. Speaking of tarpon, the three most popular Apalachicola Bay fish, judging by Tom”s customers, are redfish, speckled trout and tarpon. Tarpon is seasonal and is “catch and release” only, by law. So if you want to keep your catch, redfish and trout are for you. With this equipement, there are two basic styles of fishing—flats and bay. For fly fishing on the flats, one angler stands at the bow while an experienced guide or friend poles the boat through shallow water. They sight the fish ahead and the angler then casts directly at it. Flats fly fishing is mostly “catch and release”. Bay fishing uses a bigger boat that can hold 4-5 people. Fishing in deeper waters—2-5 feet—using spinning rods with bait or lures, this is often “catch and keep”. If you have your own boat and are an experienced angler this article in Florida Sportsman may be a helpful guide. If you are new, you might get some modestly priced equipment and try your luck from the piers. There are several well-constructed and popular piers in the area. Battery and Lafayette parks each have a long pier with a covered fishing platform. There are also two long fishing piers at each end of the St. George Island Bridge. If you do go it alone, be aware of the licensing and catch limit laws. You can find these at the Florida Fish and Wildlife Conservation Commission website or on a laminated fold-out with a fish species guide for the Gulf of Mexico, available at Apalach Outfitters. However: if you are new to fishing or the area, your best bet is a good fishing guide. We spoke with Kathy Robinson, booking agent for Robinson Brothers Guide Service. 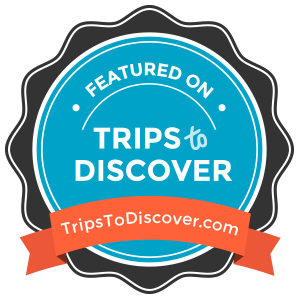 Kathy is a wealth of knowledge about all things “Apalachicola Bay fishing”. She writes regular monthly articles for Coastal Angler Magazine. 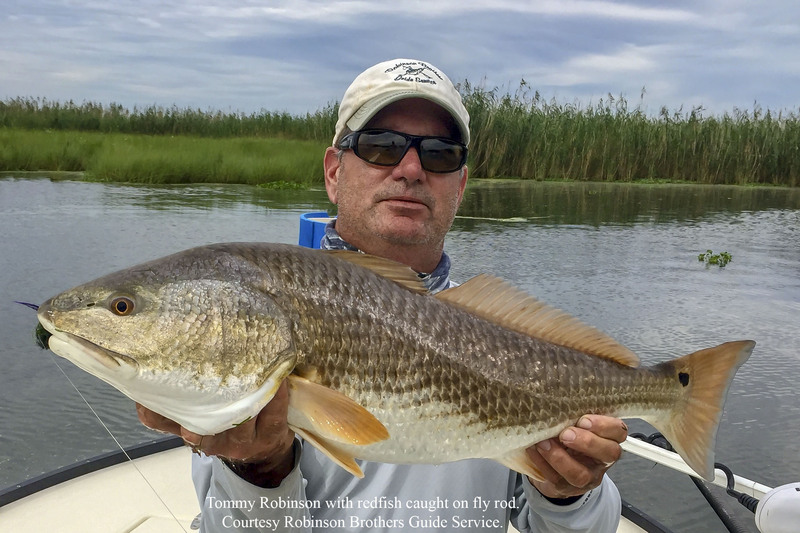 The Robinson brothers, Tommy and Chris, have run their guide service here for over twenty years. They specialize in flats and bay fishing but also have offshore guides. So what do you get with a guide that you can’t do on your own? 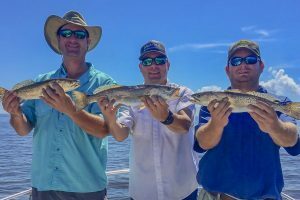 A trio of speckled trout. Courtesy Robinson Brothers Guide Service. For starters all equipment is provided: boat, rods, reels, bait, and lures. Just as important, a guide provides you with a license to fish for the day and maintains the correct catch limits in number and size. And that is just for starters. Bait or lures, how and where to cast? Kathy explains that their guides have grown up fishing in the bay since they were kids. They know where to go, what to do, they judge the wind direction, the wind speed, the time of year, the time of day, the water stream, and the tide change. Whew! Got all that? One more thing if you are using a guide: be sure to book ahead. For the more popular fish and times of year, Kathy says some of their guides are booked a year or more in advance. 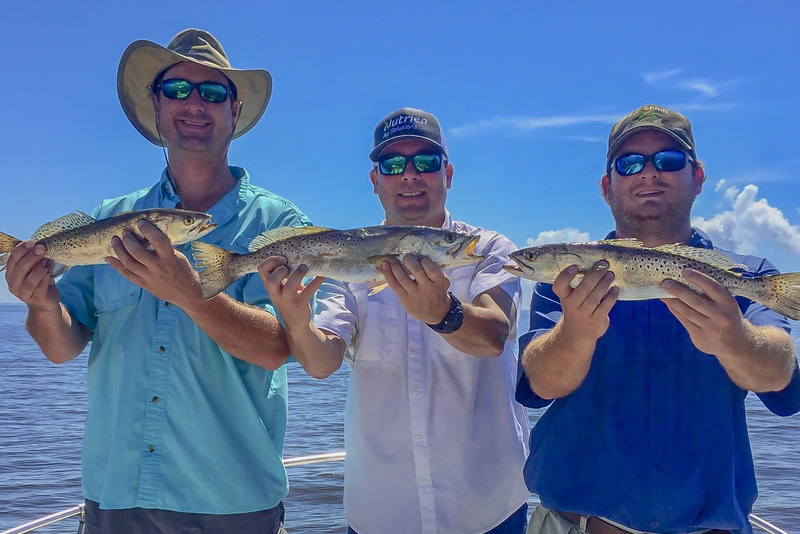 Now about those redfish and speckled trout. Are there more? You bet, lots more. In October your chances at flounder are good too. But ask Kathy for her complete fishing calendar. Keep an eye on it and you’ll be landing tripletail, sheepshead, black drum, bluefish, pompano, tarpon, Spanish mackerel, cobia, black-tip sharks, and more. That’s a boat load of fish. So, you’ve got a big catch. Don’t know how or have the time and equipment to prepare it right? Not to worry. Apalachicola is a seafood town. Most restaurants will be glad to prepare it for you. At the Owl Cafe, for example, they will prepare your (cleaned) catch fried, grilled or blackened and serve it to your family or group for a reasonable fixed price per plate that includes a salad and two sides. When you throw a line in the water, just remember it’s called “fishing” not “catching”. There are no guarantees. But with good choices of place and equipment, your chances with redfish in October are very, very good.